Anyone who has purchased any of my tutorials knows that I rarely make anything with colors “straight from the pack.” Here’s an example of a gorgeous muted brown I created for a bunch of different scraps. This fabulous collaged veneer was made using my new “Faux Collage Veneers Tutorial” available here. This jumbo dragon, “Egnaro” stands 4″ tall and is massive compared to my other miniature dragons. View him here. These little bird faced pendants were made using the tutorial from Christi Friesen’s April Neighborhood Member’s tutorial. Join Christi’s Neighborhood here. This Living Tree Collage was again made using my new Faux Collaged Veneers tutorial. These Tulip Parker’s were sent to Parker’s Subscription Box members this month to help ring in the spring season. These really interesting polymer clay beads I made from a combination of two tutorials: Debbie Crothers Surface Effect Beads and Ginger Davis Allman’s Organic Beads. This is one of my favorite newer dragons, Beauty, from Week 16 of the Polymer Clay Challenge. She’s been the inspiration for a lot of color palettes around my studio lately. I have never “painted” before in my life. My church sponsored a “Paint and Sip” event to sponsor our Youth Group and learn how to paint all at once. It was a fantastic event. This is my painting. Online communities are a LOT of fun. Parker is hard at work gathering clay enthusiasts and has opened up his own clay group: Parker’s Clay Tribe. It’s a FREE group for anyone who plays with clay on FaceBook. We have swaps, challenges, prizes, and even giveaways. Anyone is welcome to join. Parker’s Clay Tribe is sponsored by Parker’s Clayful Tutorials Club. 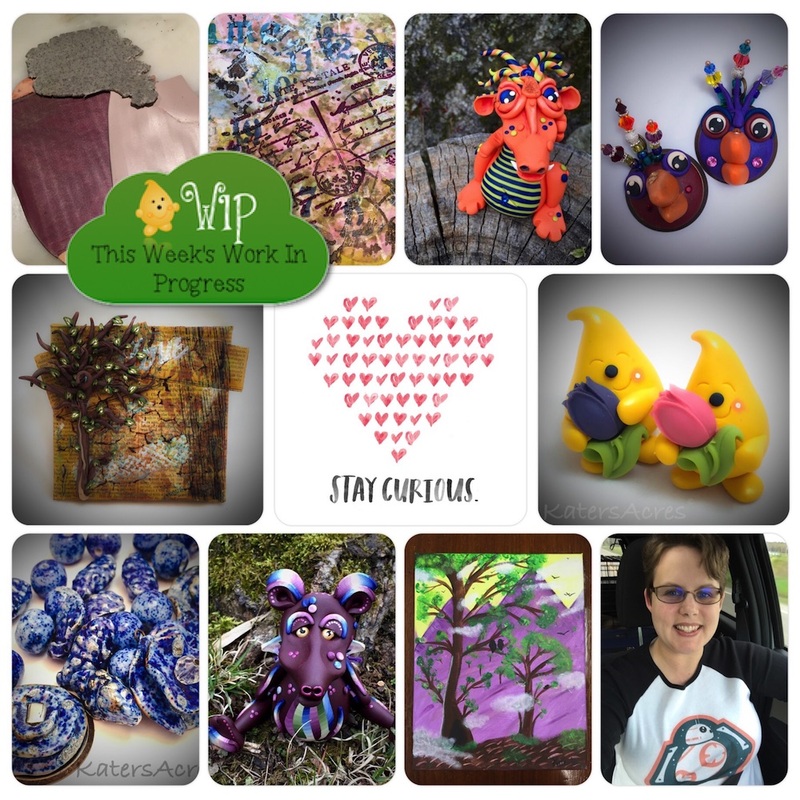 Consider becoming a member and learn to make your own whimsical creations. There are so many unique and wonderful classes at this year’s Polymer Clay Adventure (including one from yours truly). Are you one of the hundreds of people joining in on the fun? I can’t stress to you enough how phenomenal this Adventure is. You get to try a wide variety of projects, techniques, and styles. This Friday Olga Poltavets will teach us how to make some gorgeous flowers. Gorgeous and highly detailed, I have been highly anticipating this class. I invite each of you to join us, it’s such good fun! There are three ways to pay for your Adventure: full payment, a gift for someone you love, or pay for it over 3 monthly installments. My favorite by far this year is Laurie Mika’s home and studio tour and he tiny tin shrines class. WOW! What fun. You can read about my project I did from her class here. This course is just one of 23 others that you will be taking in the 2016 Polymer Clay Adventure.